Ofcom has today announced a review of the retail market for standalone landline telephone services, to ensure that customers receive value for money. 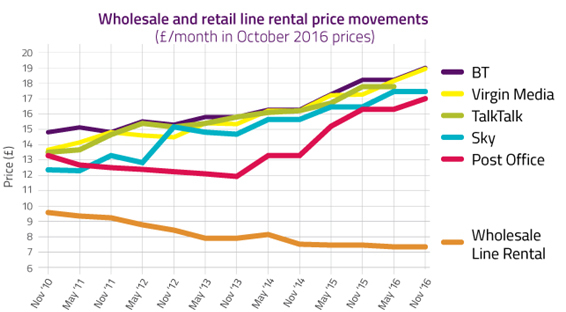 Jonathan Oxley, Ofcom’s Competition Group Director, said: “Our evidence shows that landline providers have been raising the price of line rental, even as their costs have been coming down. Ofcom is reviewing these wholesale markets under the Electronic Communications Framework. This Framework applies to all transmission networks and services (including access) for electronic communications including telecommunications (fixed and mobile), e-mail and access to the internet. Ofcom may impose appropriate remedies in retail markets in which there is significant market power where wholesale remedies would not achieve its statutory objectives. Source for Chart 1: Ofcom Communications Market Report (Figure 4.34). Ofcom / operators / ONS. Between 2011 and 2015 the average home broadband data use per month increased from 17 GB to 82GB. Source for Chart 3: 2015 Jigsaw residential survey (wave 1). Half of British households could switch to faster broadband today, Ofcom has found, as it announces a range of action to protect loyal broadband customers and help people get a better deal. We've announced an initiative to help consumers engage with communications markets. We want more people to shop around with confidence and take full advantage of the wide choice on offer. Ofcom has published its 2017/18 Annual Plan, outlining its priorities for the next financial year.